Sandwiches may be made from one of three or four kinds of bread; whole wheat bread, Boston brown or oatmeal bread, white bread and rye bread made into square, deep loaves; in fact, all bread used for sandwiches should be made especially for the purpose, so that the slices may be in good form, and sufficiently large to cut into fancy shapes. The butter may be used plain, slightly softened or it may be seasoned and flavored with just a suspicion of paprika, a little white pepper, and a few drops of Worcestershire sauce. For ordinary sandwiches use the bread without toasting. For canapés, toast is to be preferred. Sandwiches are principally used for buffet lunches or evening sociables, where only a light, substantial lunch is required. In these days they are made in great varieties. Almost all sorts of meat, if properly seasoned, may be made into delicious sandwiches. If the meat is slightly moistened with cream or olive oil, sandwiches for traveling, provided each one is carefully wrapped in oiled paper, will keep fresh three or four days. The small French rolls may have the centres scooped out, the spaces filled with chicken salad or chopped oysters, and served as sandwiches. The rolls may be made especially for that purpose, not more than two inches long and one and a half inches wide; with coffee, they make an attractive meal easily served. 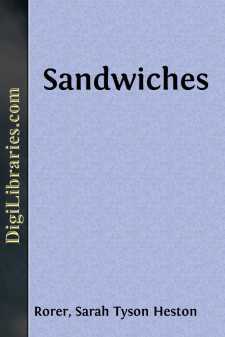 Ordinary sandwiches may be made either square, triangular, long, narrow, round or crescent shaped. One slice of bread will usually make one round sandwich and one crescent, provided the cutting is done economically. Meat used for sandwiches should be chopped very fine and slightly moistened with cream, melted butter, olive oil or mayonnaise dressing well seasoned. Fish should be rubbed or pounded in a mortar; add enough sauce tartare to make it sufficiently moist to easily spread. Turkey, chicken, game, tongue, beef and mutton, with their proper seasonings, moistened with either mayonnaise or French dressing, make exceedingly nice sandwiches.